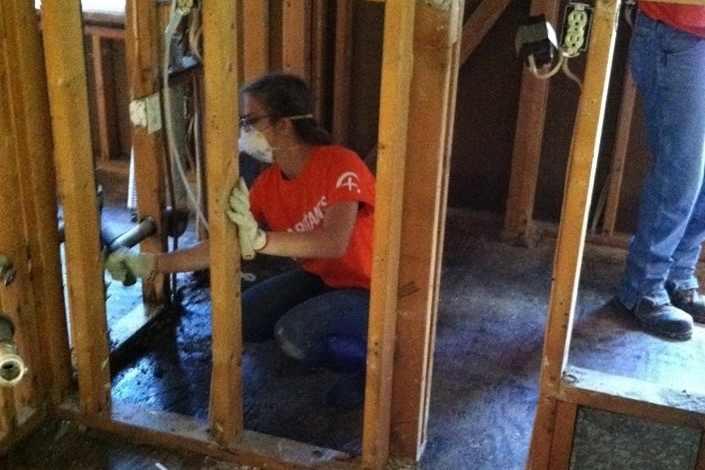 We traveled to Davy, West Virginia to work with Mountain Home Ministries. We prepared an old Methodist church into a community center where residents of the area can gain assistance with personal, home and spiritual issues facing them in a very economically deprived area of Appalachia. Davy is in the southern part of the state in the heart of coal mining country. With the war on coal going on in the environmental arena, little has done to assist those who work in the mines. The loss of jobs and income in the area has devastated little communities like Davy all throughout the area. Businesses have been forced to close and families have been forced to rely on government assistance to survive. The future of this area is very dark and drug abuse is rampant. The people of this area are very proud and resilient and are willing to help get their community back to what it was in years gone by. North has been involved in assisting Mountain Home Ministries for the last year in preparing the old church into a center to house work teams to be able to go out into the community to help those in need. The road into Davy passed through this tunnel. 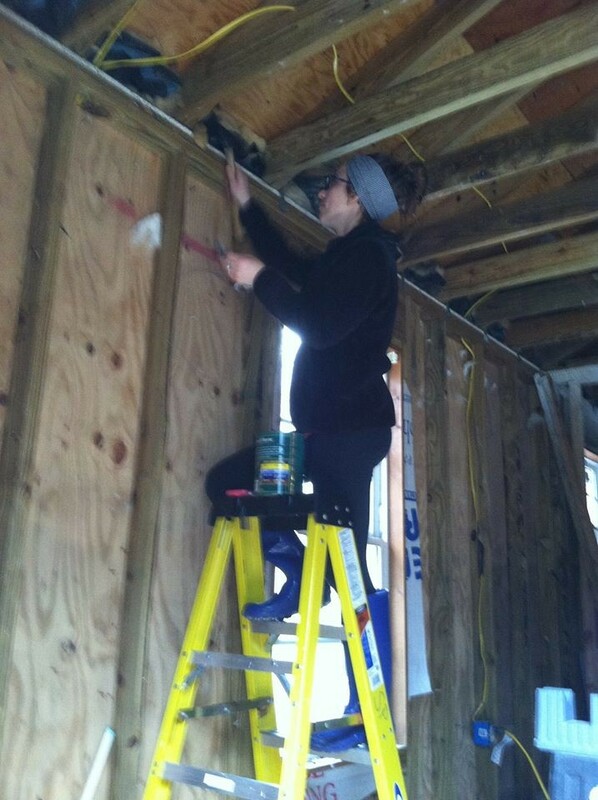 North's Domestic Missions Team traveled to Elkview, WV on Friday, March 31-April 2 to work on the rebuilding process of two homes. 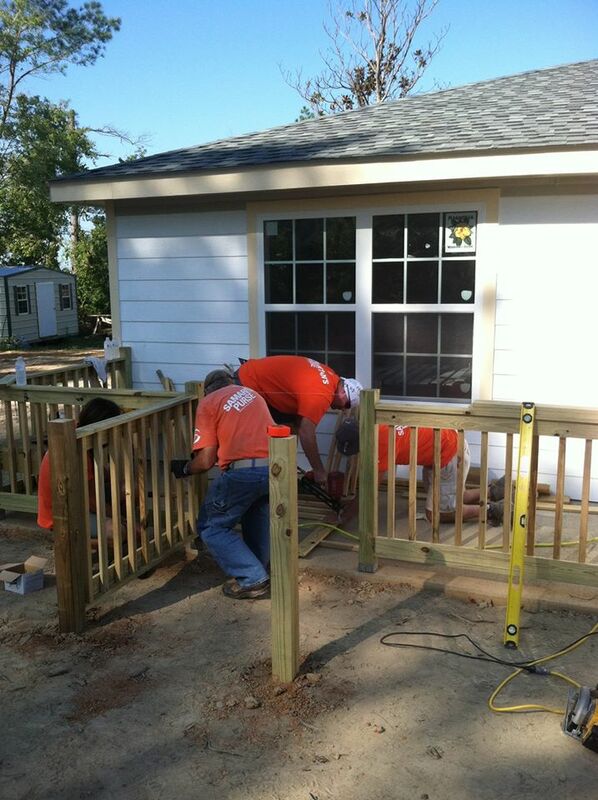 One home was completed and the homeowner was glad to be able to move back into the rebuilt area. The second home would take a little bit longer to complete since it was gutted to the framework and is being completely put back together. Saturday, April 8th we returned to the second home we had worked on the previous weekend. Ms JoAnn and Mark were so glad to see us come back and help that JoAnn went to the neighbors and baked us a big pan of brownies. Mark said that our coming back inspired him to start working in the house again. He said that the day after day working on it by himself and not seeing any progress had taken a toll on him. Many small projects were taken care of but there are still more to do. Terry and Aaron cut green board for the bathroom. 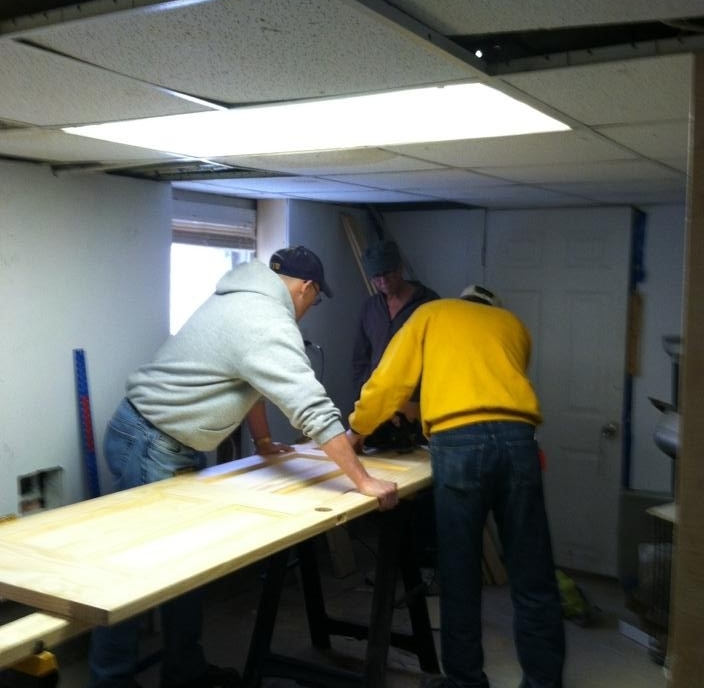 Aaron, Terry and Jim install green board in the bathroom. Walls and ceiling were installed. Ben and Barb install rod and shelving in closets. Aaron preps the ceiling for green board. Gene, Dawn and Barb painting. Dawn, Gene and Jim finish painting and installing the handrail. Sink and refrigerator were reinstalled after painting. 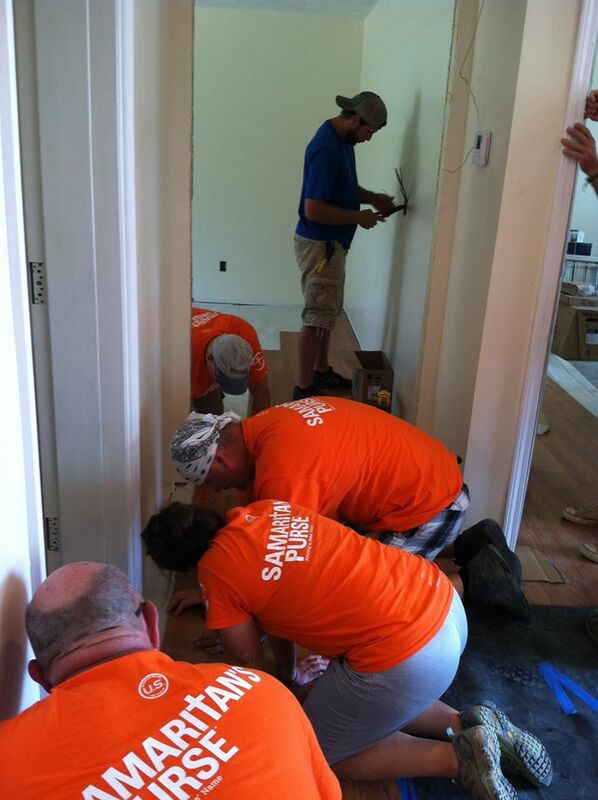 Ben and Christina install hardwood flooring. 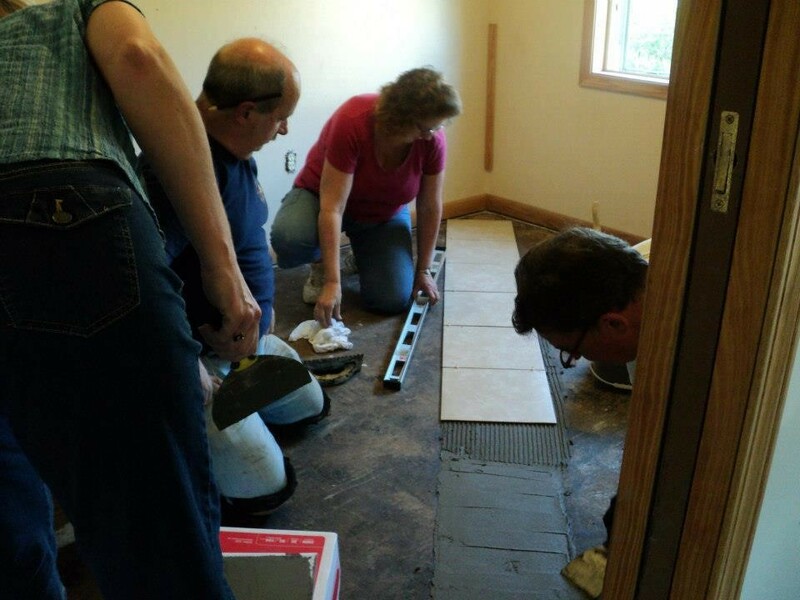 Aaron, Ben and Christina put the final pieces of flooring in place. On June 23, 2016 the central West Virginia counties received more than 10 inches of rain in a few hours. This historic rainfall caused severe flooding to several counties and claimed the lives of 24 people along with historic high flood levels and damage to entire towns. It has been billed as the "1000 year flood." 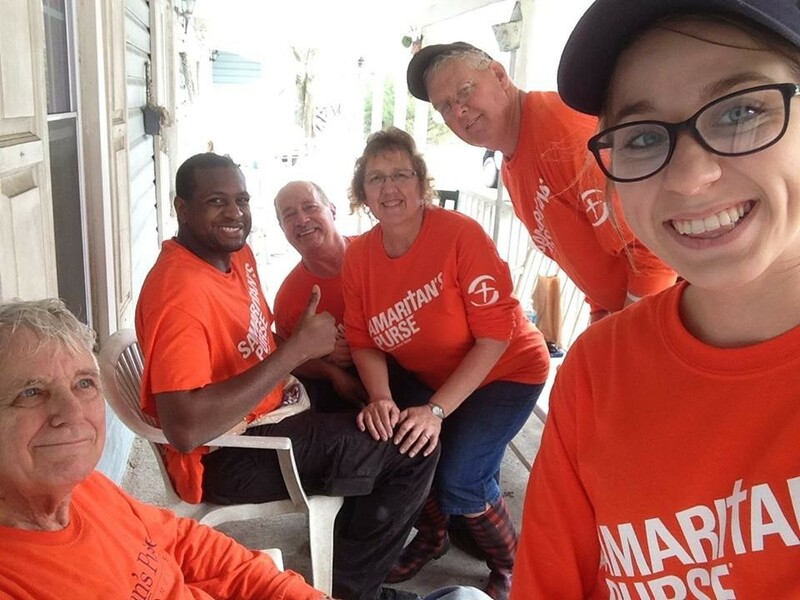 Members of North's Domestic Missions Team spent five weeks helping the survivors clean out their homes of soaked possessions, mud and sheet-rock. 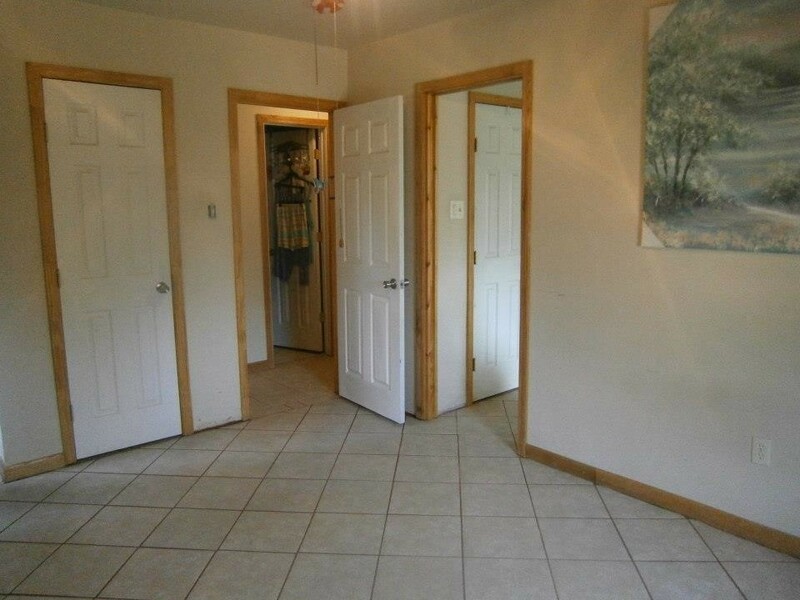 We cleaned the homes of the mud and mold that had started to claim the home. The most important part of our day was spent talking to the homeowners and sharing the love of Jesus with them. This shows the typical mold growth we encountered in many of the homes we cleaned out. After the furnishings were removed to the roadside for pick-up the floor had to be removed down to the sub-floor. The home is nearing completion. The sheet-rock has been removed to the ceiling and the flooring down to the sub-floor. The home is now ready for mold mitigation. Not only does the house need to be cleaned out but the basement or crawl space has to also be cleaned out so that the home can dry out properly. The things the home owner has stored under the home needs removed along with the furnace duct-work. 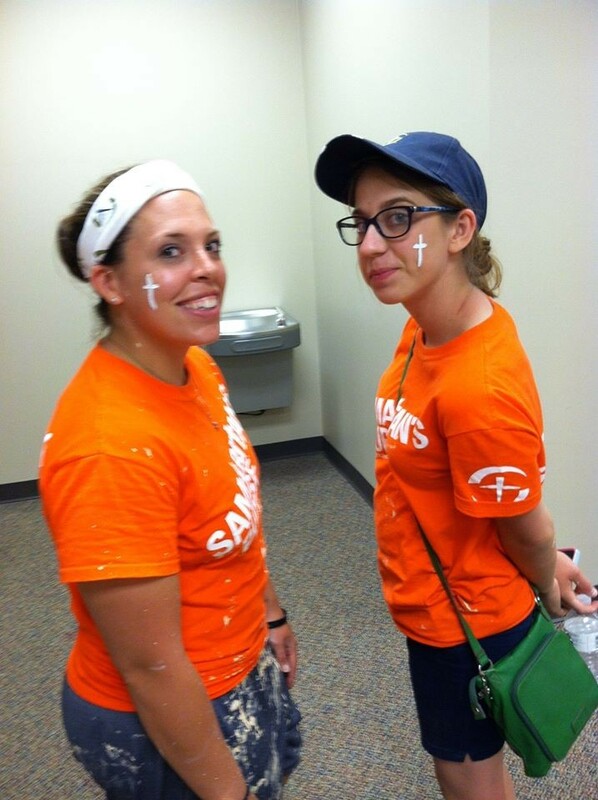 This is three of our team members after spending the day cleaning out from under two homes. This is the Abbott family whose two home's we cleaned out. This was on the wall of one of the homes we worked on. It says it all, He is our strength indeed. The rain that fell in upstate Louisiana during the storms on March 9 created severe flooding. Up to 10 inches of rain fell forcing evacuations in parts of Mississippi and Louisiana. With so many roads closed, that Monroe officials ran out of barricades and Ouachita Parish ran out of sandbags. "In north Louisiana . . . you can't get there unless you have a boat," State Police Capt. Ronnie Jones said, adding that at least 65 roads were closed in the region. Removing the contents down to the studding. Multiple areas in South Carolina have received 20 inches of rain or more as a result of historic rains from Hurricane Joaquin. The torrents of rain caused deadly flooding, claiming more than a dozen lives. Every trip has many teaching moments. In the early weeks of October, the state of South Carolina received over 20 inches of rain from from a massive storm that pounded the area with rain for days. The flooding closed parts of interstates, the University of South Carolina, and many businesses and homes. Not only did the homeowner lose the possessions inside the home but the cars were also under water. The blue tarp is for placing the furniture that can be cleaned and saved to go back in the home after rebuild. Morning briefing, job assignments and most importantly prayer. Aaron sorting items that can be salvaged. Gene and Ron help clean out another part of the home. The Louisville tornado was part of a four-day tornado outbreak that caused extensive damage to the central and southern parts of the U.S. and causing 35 fatalities. The Louisville tornado re-intensified as it continued sharply northeastward into the south side of Louisville at EF3 strength, destroying numerous homes in residential areas. The tornado then re-attained EF4 strength as it completely destroyed three large factories in an industrial area of town, including a Georgia-Pacific plywood plant. The tornado maintained its strength as it devastated nearby subdivisions and an apartment complex, with some homes and one of the apartment buildings reduced to bare slabs. 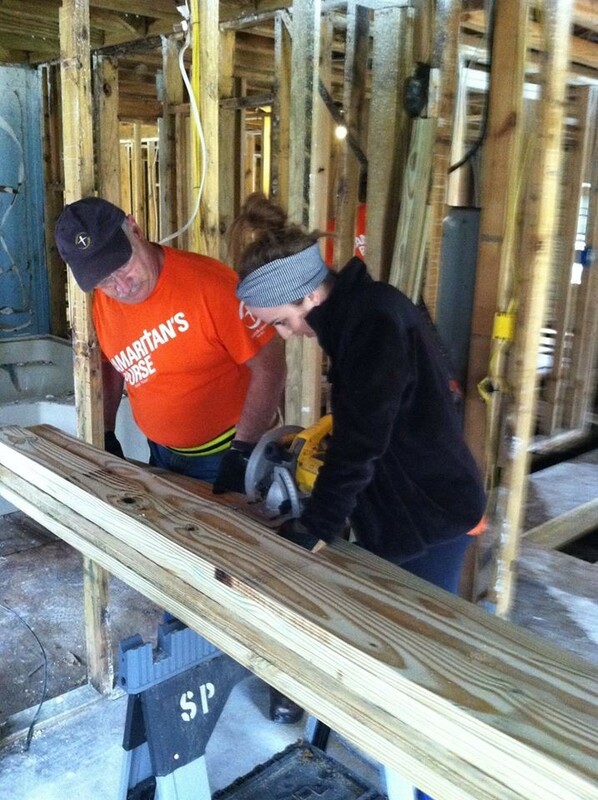 This mission trip we were rebuilding a home destroyed from the tornado. Ms Earnestine's home was so badly destroyed it had to be demolished and a new one rebuilt in it's place. Ms Earnestine and our North team. 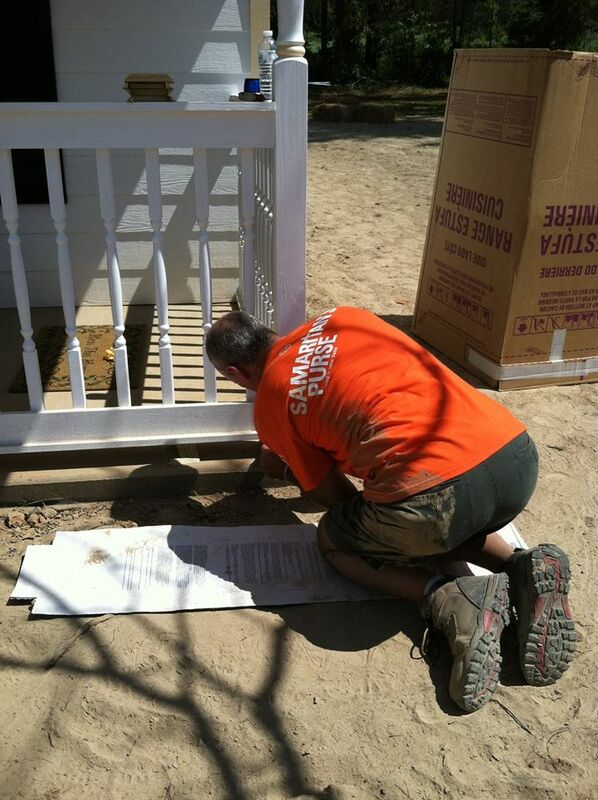 Terry doing the final trim work on the front porch railing. 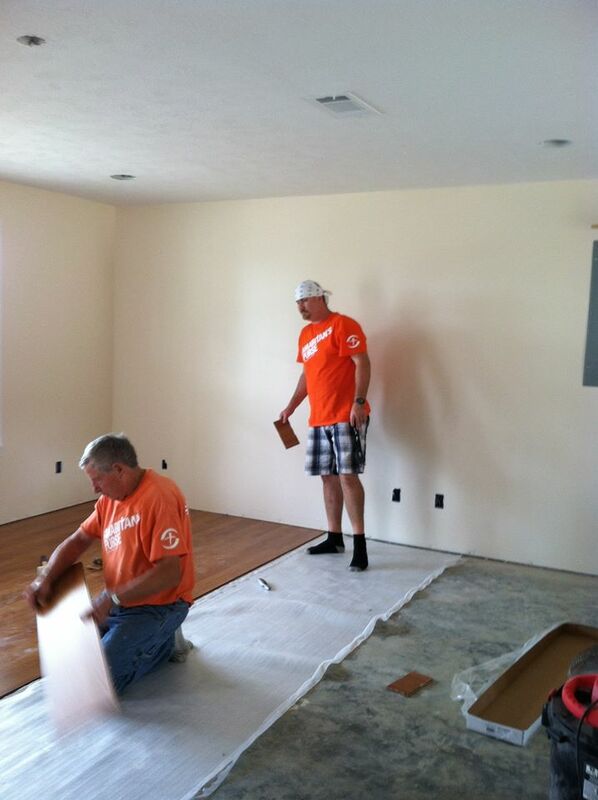 Laminate flooring being installed by Aaron, Ron and Barb. October 29, 2012 brought Hurricane Sandy (Super Storm Sandy) into the Atlantic City, New Jersey shore line. Coastal flooding and wind damage were all up and down the New Jersey coast. 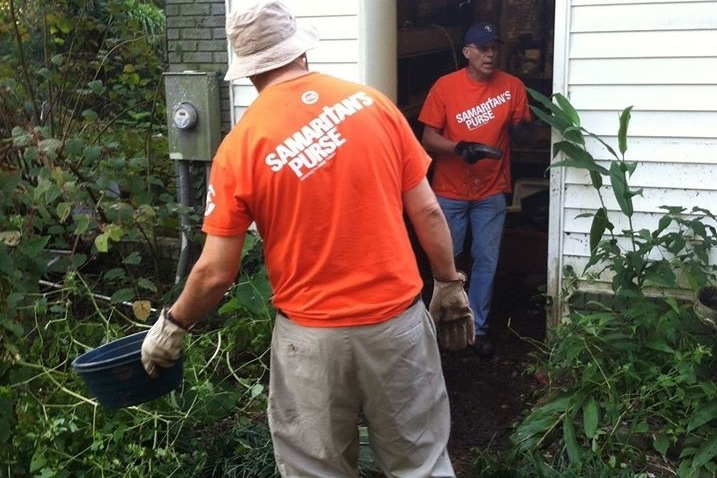 Our mission team made two separate trips to the area to help those devastated by this storm. Jim removes some woodwork in preparation for installing the ceiling. Terry, Brooke and Jim finish the ceiling. 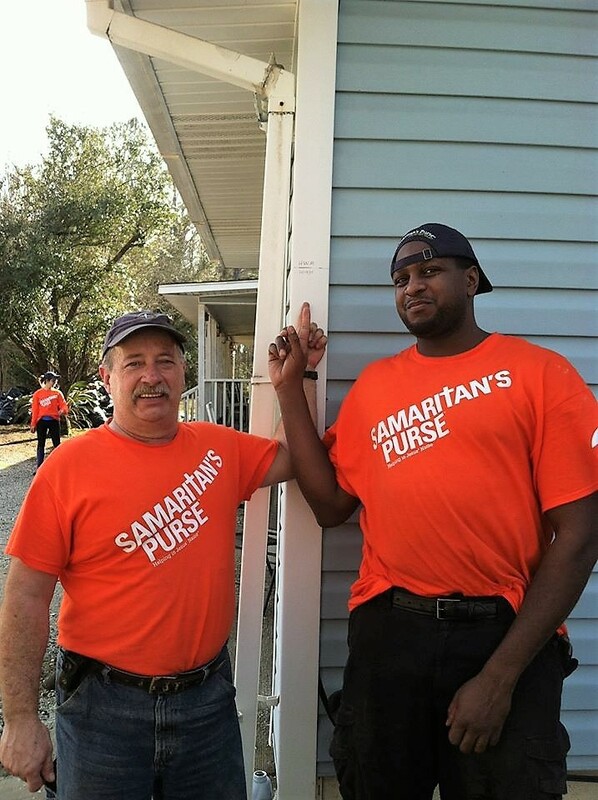 Gene and Terry work on one of the seven doors we replaced for this home owner. Ron and Don install another door. Jim prepares for the installation of the new kitchen. D'Iberville was just one of many communities affected by Hurricane Katrina. Ms Arline's home was flooded by sea water as the storm surge came ashore. 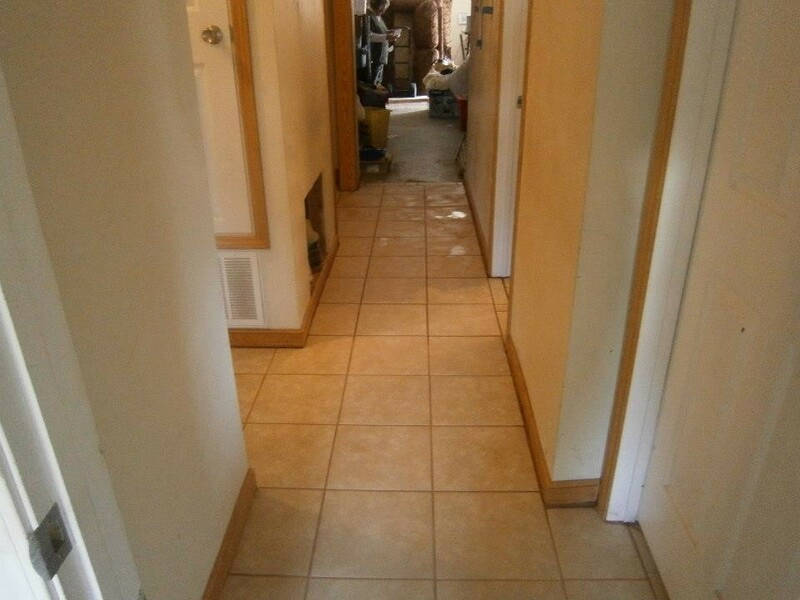 We installed ceramic tile in Ms Arline's home. Jim, Nic and Randy do the final estimating of the project details. On April 27, 2011, Tuscaloosa was hit by a half-mile (800 m) wide tornado, which was part of the April 25–28, 2011 tornado outbreak in the region. It resulted in at 44 deaths, over 1000 injuries, and massive devastation. Officials at DCH Hospital (alone) in Tuscaloosa reported treating more than 1000 injured people in the first several days of the tornado aftermath. Initially, officials said that "more than 50 children arrived alone" at the hospital, raising questions about the possible loss of their parents, and 30 of these children were transferred to pediatric trauma wards, indicating serious injuries. Mayor Walter Maddox was quoted saying that "We have neighborhoods that have been basically removed from the map." Our team did clean-up in many different neighborhoods. Neighborhoods were completely wiped of the map.